Main Gallery at Cedar Hill Arts Centre. On August 30 2014, the Community Arts Council of Greater Victoria held a successful fundraiser at Abkhazi Garden. One of the grand prizes was a two week exhibition at the Main Gallery at Cedar Hill Arts Centre. Included with the complimentary gallery space was a promotional webpage by Art Openings. Judee Doyle was the lucky winner of this package. She celebrates with a delightful show that runs April 10-22. Aptly titled ALLSORTS, the exhibition brings together an eclectic group of over 15 talented artists, some from Alberta, Toronto and Vermont. Four of these artists are profiled in the following webpage, just a taste of the visual treats in store. 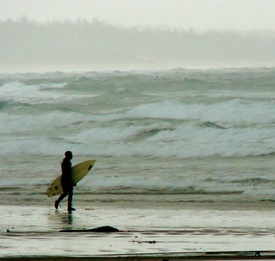 Judee Doyle is a graduate of the Visual Arts Program at Camosun College. For over a decade, her multi-media creations have graced local galleries. Judee’s artworks impressed jurors at both the Sidney and Sooke Fine Arts Shows. Monday Magazine presented her with a photography award. Jan Johnson (1943-2011) was a 22-year-old lieutenant in the Viet Nam war. After his war experiences, Johnson graduated from university and worked in Ottawa for the federal government. He also began to create art. Jan Johnson traveled widely and worked In Asia and Africa, learning from other cultures and artists. 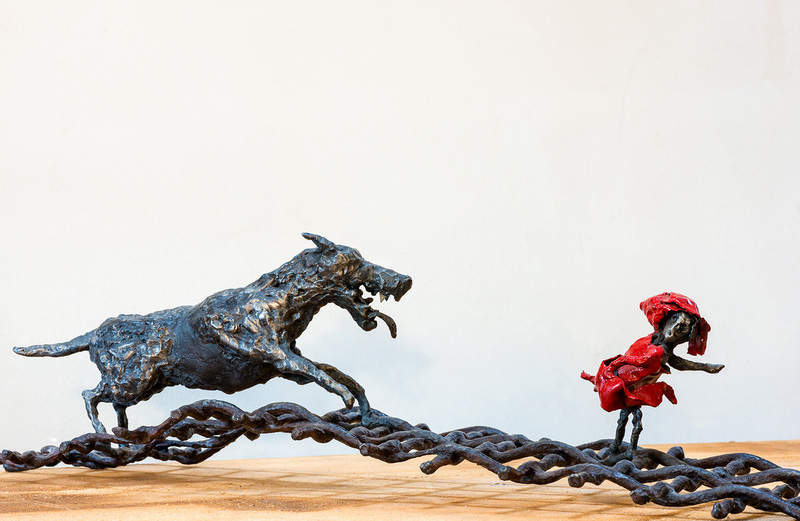 The Sooke-based artist used a blow torch to weld recycled metal materials into sculptural scenes with narrative content. Many dioramas are populated with small figures struggling against insurmountable odds; some larger pieces are articulated, humorous, starkly surreal and function as fountains and gateposts. All crackle with ironic commentary on the darker side of human behaviour. Jan’s widow, Mary-Alice Johnson, still lives on the rural property that houses the legacy of this prodigious artist. Hundred’s of Jan’s original sculptures inhabit the overgrown acreage and eclectic interior spaces. “Jan’s art is all connected to human suffering,” she says, “dealing with atrocities and power imbalances, especially political and religious abuse.” Mary-Alice misses her husband, but is ready to get organized and share his artwork with the public. She is grateful to Judee for including Jan’s sculpture in her group show. Karen de Zwart discovered the art of sculptural needle felting via the internet five years ago. Intrigued by the whimsical characters created by Kay Petal, she explored the medium using on-line videos and discussion groups. Locally, Knotty by Nature Fibre Arts offer her technical support and supplies. “Elf” wool batting, wool roving and wire armature, 2012. 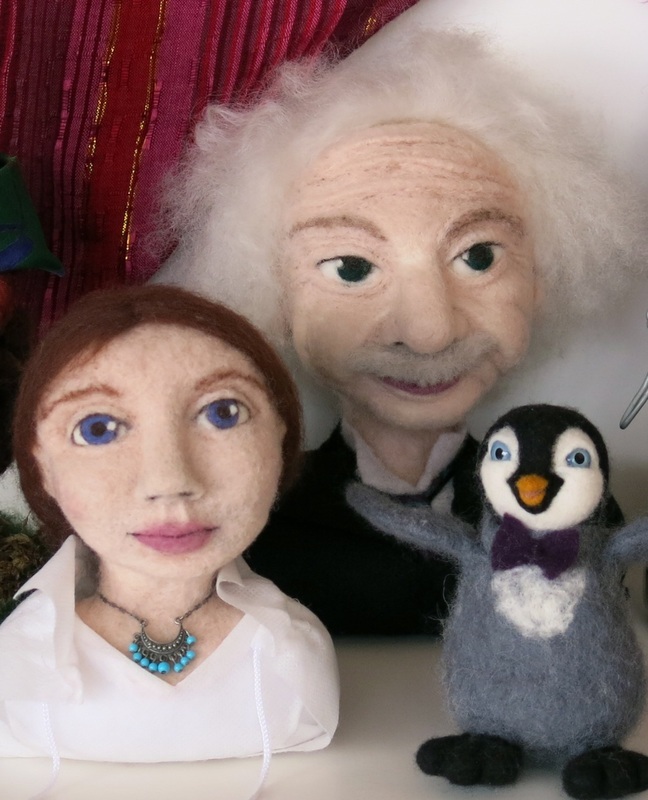 “Einstein & friends” wool batting and roving, 2012. “Fairy Celia” wool batting, wool roving and wire armature, 2014. Karen de Zwart with needle felting creations. The artist uses sturdy Corriedale wool for her interior cores and softer Merino wool for details and exteriors. Expressive details in the face and hair come last: lips and eyes can be hand-painted or acrylic eyes and tiny eye-lashes added for extra lustre. Clothing is constructed with special fabrics and much precision as shown on the elf figure. Karen’s creations have evolved from all-wool miniatures to larger, more animated creations. “I use 12-14 gauge wire and pipe-cleaners to make an armature,” she explains. The various forms come from her imagination, and spring to life as she carefully models the wool rovings and battings. “Poking wool with a needle takes a great deal of patience,” she says. Rita Ioannidis lives in the rolling rural farm country of Vermont. She is Judee Doyle’s sister. Rita began painting with watercolours about one year ago, but now favours acrylics for their intense colours. “Three Sheep and a Farm” 12x16 in, mixed media, 2014. “Somewhere in Russia” 12x24 in, mixed media, 2013. Her bright, cheerful artworks also include hummingbirds, flowers and much-loved forests. “I’m very inspired by the creative energy of my Mad River Valley community,” she says. Each August, the area hosts the Vermont Festival of the Arts. The Big Red Barn Art Show exhibits over 30 valley artists. Last year Rita participated in this popular event, which draws thousands of visitors to the area. A frequent traveller, her subject matter includes scenes from Iran, Baku, Turkey and Russia. “Sam” 12x24 in, mixed media, 2014. “My Forests” 24x36 in, mixed media, 2013. Kate Cino previewed arts events for 18 years at Boulevard magazine. She has a History in Art degree and Public Relations certificate from the University of Victoria. "Above and Beyond" award sponsored by Black Press. This website and its content is copyright of Art Openings, 2009. All rights reserved. Written permission is required for reproduction of photos or text. Arts Centre at Cedar Hill is located at 3220 Cedar Hill Road in Victoria.